The Library recently received a generous donation of the collection, “100 Books for Understanding Contemporary Japan,” from the Nippon Foundation, an independent, non-profit organization that supports projects both in Japan and overseas. Of the list of English language books selected by ten experts with extensive knowledge of Japan, Falvey added about one-third of the titles which were not already part of our holdings. The Foundation donated these titles promoting a greater understanding of the true face of contemporary Japan to selected university, special and public libraries that have an interest in Japan. The titles can be located in the library catalog by searching the key word phrase “Nippon Foundation.” Subjects included range from religion, history, economics, commerce, education, political science, literature and the art and science of Japanese robots. 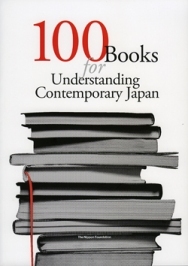 A catalog of the “100 books” is also held by the library. Falvey was alerted to the program by A. Maria Toyoda, Ph.D., chair, political science department, and Yukie Yoshikawa, a fellow at the School of Advanced International Studies, Johns Hopkins University. The Nippon Foundation funds activities in three areas: domestic social welfare and volunteer support; maritime research and development; and overseas cooperative assistance.